AIRMOULD® is the patented gas-assisted injection molding process developed by WITTMANN BATTENFELD. There are 2 variants: AIRMOULD® internal gas pressure and AIRMOULD CONTOUR® external gas pressure. The AIRMOULD® process offers the user major advantages especially with regard to a better surface finish and higher dimensional stability. 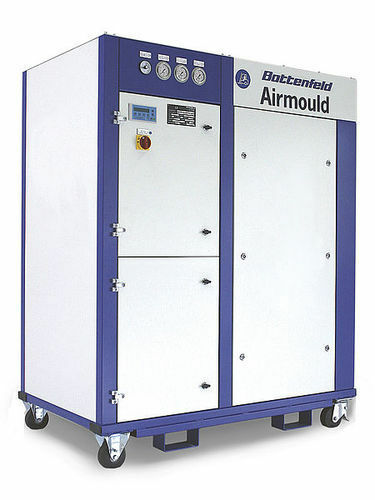 The modular AIRMOULD® system is suitable for gas-assisted injection molding with internal and external gas pressure. Melt injection into the cavity. Injection of nitrogen into the melt either through the machine nozzle or through nozzles in the mold. Gas pressure is maintained until the part is sufficiently cooled and has reached dimensional stability. Reduction of gas pressure prior to mold opening. Mold is completely filled with melt. Injection of nitrogen between melt and cavity wall through special injection modules. Throughout the cooling phase, gas pressure acts as holding pressure. Gas pressure is released prior to mold opening. Nitrogen generators: SE series, mobile units, store nitrogen filtered from the surrounding atmosphere through a multi-membrane system. Pressure generator: DE series, nitrogen is compressed to an operating pressure of 300 bar. Control and regulation: stationary or mobile electric control system combined with up to 8 pressure control modules or monomodules. Gas injection: either together with plastic material through AIRMOULD® machine nozzles or via AIRMOULD CONTOUR® injection modules. Wittmann Battenfeld India Pvt. Ltd. was commenced in the year 2007 as a Private Limited Company. We are instrumental in manufacturing, trading and supplying a wide range of Toggle Machine, Hydraulic Injection Molding Machine, Injection Molding, Robot Controller and many more. Apart from these, we are also rendering Inline Thermography Service and more. We provide our products and services as per the customers demand.